For the less experienced bicyclist, navigating a busy roadway can be a challenge, even with the addition of designated cycle tracks. The cycle track separates the bicyclist from a vehicle lane, however does not address the issue of making safe turning movements across multiple vehicle lanes without interacting with vehicles or operating in vehicle lanes. The Two-Stage Turn Box is a new approach in increasing the safety of this turning movement by grouping together similar movements and increasing the visibility of bicyclist wishing to cross the street. Two-Stage Turn Boxes are used to help bicyclists make a left turn movement at an intersection without encountering any conflicting vehicle movements. They accomplish this by splitting the turning movement into two separate through movements. Figure 1, below shows an existing Two-Stage Turn Box along Washington Avenue SE on the University of Minnesota campus with each phase of the turn box shown. 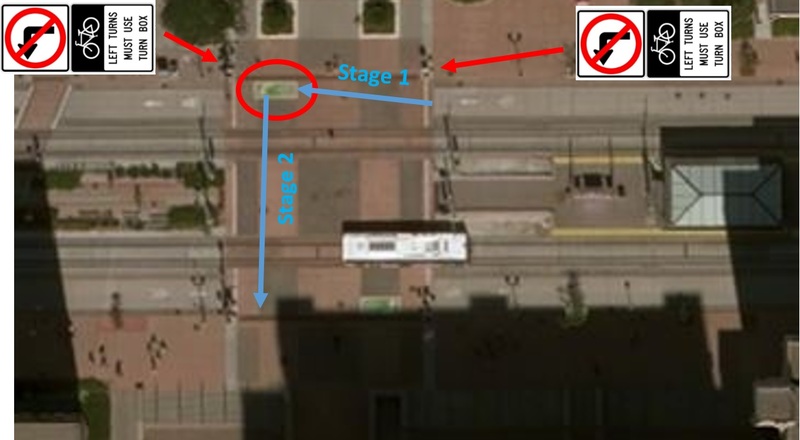 As shown in Figure 1, Stage 1 of the Two-Stage Turn Box involves a westbound thru movement with bicyclist stopping in the dedicated green turn box. In most situations, this turn box should be placed just outside of the bicycle lane and the adjacent vehicle stop bar, slight variations in location do occur on an intersection by intersection basis. The location of the bike box helps ensure that stopped bicyclist do not block the thru moving bicycle movement (westbound movement above) and places the bicyclist in front of the adjacent vehicles (southbound vehicles) increasing visibility. Bicyclists then proceed through Stage 2 of the Two-Stage Turn Box, once their phase receives a green light, without worrying about conflicting vehicle movements. Additional signing is required at intersections with Two-Stage Turn Boxes directing bicyclist to make their movements using the turn box, shown above. The result of this two-stage operating is increased comfort, safety, and visibility of bicyclist in the roadway, by removing conflicting interactions between bicyclists and motor vehicles. However, this benefit comes at a cost. Bicycle delay is almost always increased after the installation of a Two-Stage Turn Box due to the separate phases. A bicyclist must now observe two phases to complete their movement, one for the through street movement and one for the cross street through movement. Without this operation, that same bicyclist might use the left turn lane and cross in a single green phase. For this reason, the installation of a Two-Stage Turn Box should be analyzed on a case by case basis to ensure the proper forethought and appropriate geometrics are applied to the design. We would further recommend it be implemented on corridor- or segment-wide if possible so all intersections are treated the same and that education/public involvement be a key factor. Happy cycling!